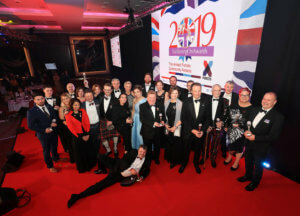 Communications specialists, Spectra Group (UK), have received the highly prestigious Queen’s Award for Enterprise in the Innovation category for their innovative system, SlingShot®. SlingShot is a small, low powered and lightweight system that delivers game-changing capabilities to existing military and first responder radio networks. When connected to military or commercial UHF/VHF radios, Slingshot extends their range from Line of Sight to Beyond Line of Sight covering thousands of mile radius by utilising the Inmarsat I-4 commercial satellite network L-TAC Service. The system works by simply converting UHF or VHF radio frequency signals to the L-Band frequency used by the L-TAC Service and is the only product of its size that enables portable tactical beyond line-of-sight voice and data communications whilst on the move. SlingShot’s unique capability offers military, emergency and disaster-relief agencies the ability to reliably communicate in remote and harsh environments without the need to rely on existing communications infrastructure or deploy additional communications infrastructure. It also enables global interoperability between coalition forces and agencies using different radio systems, without the requirement, or need, to swap equipment and receive additional training. Spectra’s innovation stemmed from a realisation in 2012 that there was a previously unutilised capability of the Inmarsat satellite that would have huge potential in both military and first responder sectors. Working closely with Inmarsat a working concept was developed and approved for use by the British military within weeks and production started in less than 9 months. SlingShot is versatile enough to be used in aircraft, vehicles, maritime platforms and dismounted personnel. Spectra has since gone on to successfully market SlingShot globally providing a capability that has proved to be of critical importance and has undoubtedly contributed to the saving of lives. With strong global sales and increasing recognition of SlingShot’s capabilities within the user community, Spectra Group opened a U.S. office in October 2018 and continue to expand their export footprint. Arnold Defense, the St Louis based manufacturer of 2.75-inch rocket launchers, will be at this year’s Quad-A, Army Aviation Mission Solutions Summit taking place 14-16 April 2019 at the Gaylord Opryland Hotel and Conference Center, Nashville, TN. Arnold Defense will be showcasing two rocket launchers at the Summit; the 19-round M261 and their ultra-lightweight LWL-12 rocket launcher weighing in at just over 60 pounds (27 kg) empty. 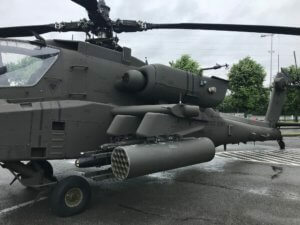 The M261 will be displayed on a AH-6 Little Bird with CFD International, and the LWL-12 will be with Arnold Defense on stand #1151 and also mounted on a MD969 Combat Attack helicopter, the latest evolution of MDHI’s iconic MD 900/902 series. Arnold Defense is the world’s largest supplier of rocket launchers for military aircraft, vessels and vehicles; they have manufactured more than 1.2 million 2.75-inch (70mm) rocket launchers since 1961 for the U.S. Armed Forces and a number of NATO customers. They design and manufacture rocket launchers that can be customized for any size, weight, capacity or form factor for platforms in the air, on the ground or at sea. Arnold’s core products include the 7-round M260 and 19-round M261 commonly used by U.S. Army helicopters; the thermal coated 7-round LAU-68 variants and LAU-61 Digital Rocket Launcher used by the U.S. Navy; and the 7-round LAU-131 and SUU-25 flare dispenser used by the U.S. Air Force. Their newest product, FLETCHER, is a 4-round laser target designated, ground-based rocket launcher; a unique concept and design that has seen exceptional levels of international interest. 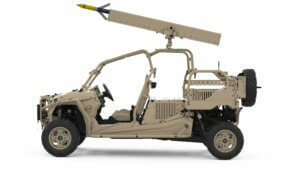 Jim Hager, President and CEO of Arnold Defense said “2019 got off to a great start with the recent announcement of a contract that could be worth up to $74.3 million with the U.S. DoD along with ever-growing international, special operations interest in Arnold’s ground-based rocket launcher, FLETCHER. As recently announced, FLETCHER has just won it’s first order. We are very much looking forward to focusing on our core business at Quad-A; a forum we know well and where we aim to showcase our continued innovation and dedication to providing only the best weapons systems to today’s modern warfighters”. Meet the Arnold Defense team on stand #1151 where you can see the LWL-12 and where Arnold Defense staff will be on hand to explain their systems to visitors and specific briefings and interviews can be facilitated. See Arnold Defense’s LWL-12 rocket launcher on the MDHI MD969 at stand #3011, and the M261 on CFD International’s AH-6 Little Bird, both in the aircraft display at stand #1611. Image: Alcon CIR55 caliper fitted to an AxleTech hub. Alcon Components Ltd, acclaimed global specialist brake and clutch company, will have one of their latest specialist calipers on display with AxleTech at Bauma 2019, the world’s leading trade fair for the construction industry. This year’s Bauma will be taking place in Munich 8-14 April 2019. Alcon’s CIR55 caliper was developed in cooperation with AxleTech and is now part of AxleTech`s brake portfolio under the Hydraulic Disc Brake family HD860 series. AxleTech specialises in the design and manufacture of advanced powertrain systems, axles, brakes and aftermarket parts for heavy-duty commercial and defence vehicles. The CIR55 caliper is designed and manufactured for specialty applications, heavy-duty vehicles, off-highway and military vehicles. Alcon can provide solutions for axles ranging from 2000 kg to 12,000 kg capacity. The CIR55 significantly increases braking performance and reduces both weight and cost in comparison to existing alternatives. Intended as a direct alternative to a standard twin-caliper arrangement, the CIR55 features a custom designed eight-piston, four-pad configuration with an option for either 60mm or 64mm diameter pistons. The caliper can be used on disc diameters of 400mm to 410mm and the centre split design allows caliper variants to be available for a variety of disc thicknesses. The fully hanging, high friction pads are fitted with an anti-rattle system and the caliper and seals are protected to cope with the harshest of operating environments. Already fully established internationally within the elite motorsports and defence sectors, where nothing short of the highest standards in quality, performance and robustness are accepted, Alcon’s products and services are prime for take-up within the construction and off-highway industry. Specialists in working closely with end users to meet unique and individual requirements, Alcon are ideally placed to develop braking solutions with specialist axle manufacturers, such as AxleTech, and wider OEMs within the off-highway sectors worldwide. Jonathan Edwards, Sales Director at Alcon said: “In partnership with AxleTech, we can currently offer the global specialist vehicle market state of the art, production ready braking solutions for heavy platforms, saving weight and improving performance”. 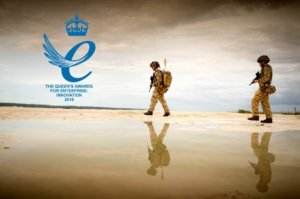 He added: “Our development and production ethos is such that we thrive in specialist environments, whilst our extensive automotive and defence production experience allows us to deliver quality and value for money globally. We believe that Alcon braking solutions have great potential for wide utility within the off-highway specialist vehicle sectors and look forward to further exploring these opportunities at Bauma 2019”. 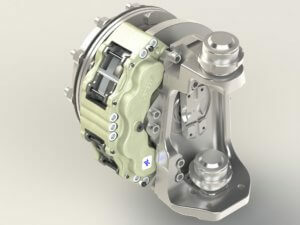 Visitors to Bauma 2019 exhibition will be able to view the Alcon CIR55/AxleTech HD860 brake among AxleTech’s products in Hall A3, Booth 419. Alcon staff will be in attendance and will be available for meetings and interviews, on appointment.